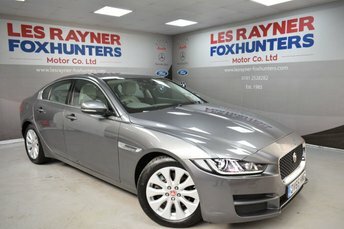 LJ65XKM JAGUAR XE 2.0 PRESTIGE 4d 178 BHP - 44k miles - 1 Owner from new. 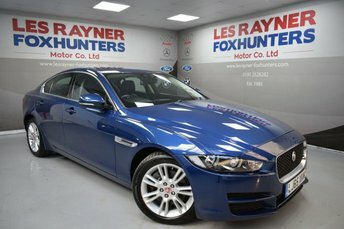 The Jaguar XE looks stunning in Blue metallic and boasts a fantastic specification of Full Black Leather interior, 17" alloy wheels, Rear parking aid, DAB and FM Radio , AUX/USB, Dual zone digital climate control, Bluetooth,Lane Guide assist, Autolights, ISOFIX, electric windows and remote central locking . The XE fits in one of the lowest emissions tax brackets meaning it is only £20 to tax , Quite remarkable for a car of its size. 76MPG Extra Urban and 67MPG Combined !! Great Value for money! 2 Keys are supplied with this vehicle! Jaguar is a name synonymous with style, performance and refinement. 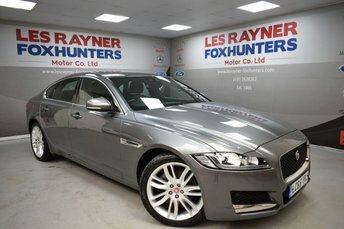 Here at Les Rayner Foxhunters Motor Company Ltd you'll find an excellent selection of used Jaguar cars for sale in Whitley Bay, all of which come fully inspected to ensure complete peace of mind. Whether you're looking for a pre-owned executive saloon such as the Jaguar XF, an SUV with the style of the Jaguar F-PACE or a pure sports car like a Jaguar F-TYPE, we'll be able to find the right used Jaguar to meet your requirements. Get in contact with a member of the team today for more information and to book a test drive in the model of your choice.